This is the time of the year when we fall in love with colours red, pink and white and anything related to the heart shape. Here I collected 10 of the quilt ideas to make for valentines day, not just to keep them in my to do list but also help you find some inspiration. 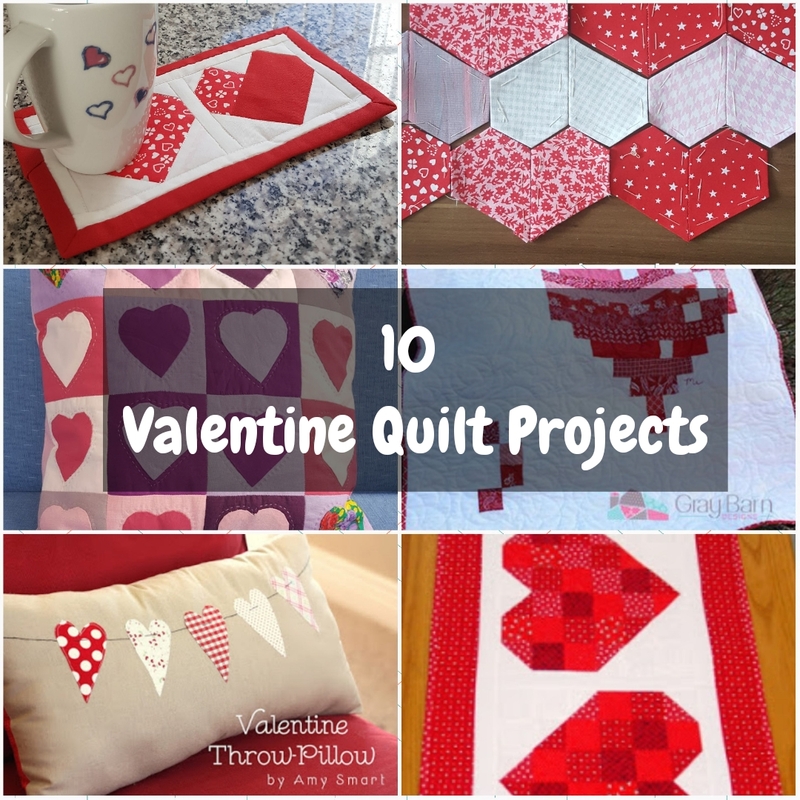 Most of these are simple and quick patterns; some are mine, some are from other quilters and they all look amazing. 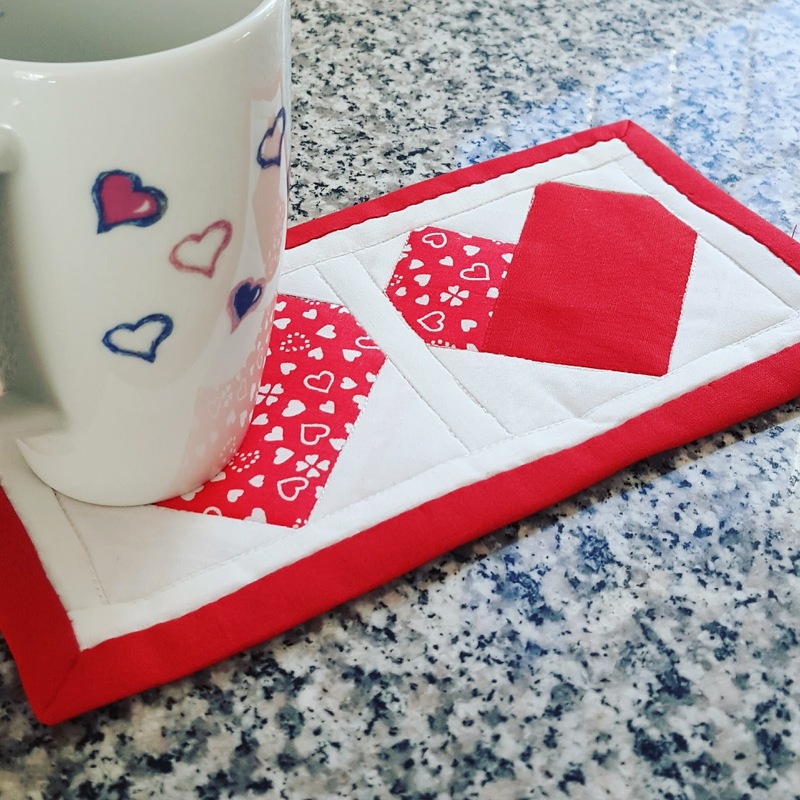 What's more, I chose the valentine quilt projects using different techniques, to make mug rugs, wall hangings, cushions, quilt blocks, table runners and lapsize quilts. Have a look at them in case you need some inspiration. Already working on some projects? Why don't you share it here in comments with us? Here we go! 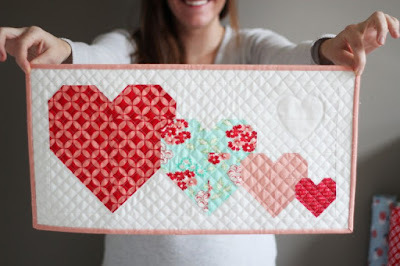 An easy and quick project made by foundation paper piecing. The free pattern is also in the link. 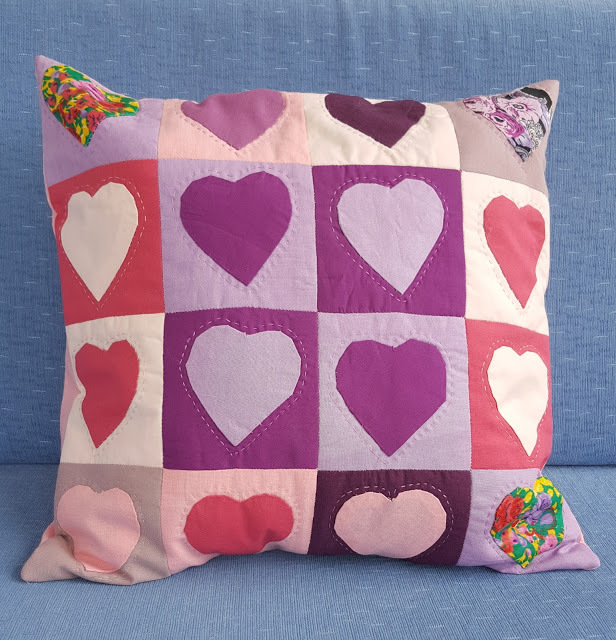 This cushion is made by appliqué hearts with red, green, lilac and purple colors. 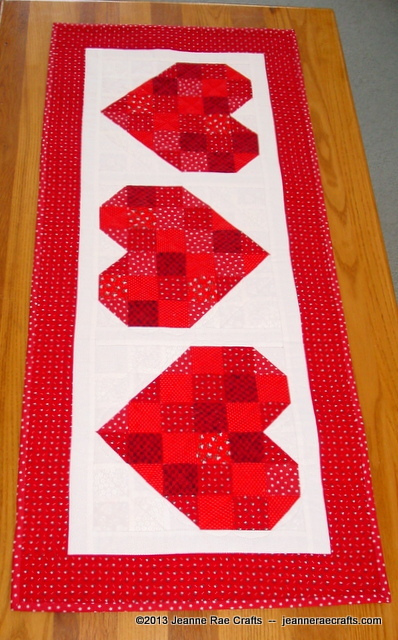 Another valentine project with english paper pieced hearts. Scrappy hearts table runner, easy and quick project by Kingdom Crafting. Definitely in my to do list. 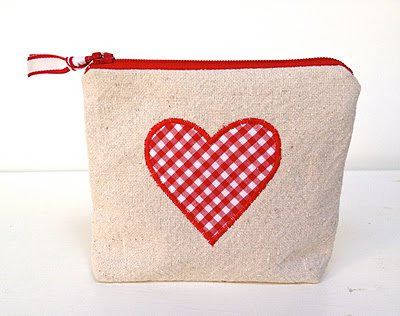 That zipper pouch is lovely and perfect to be gifted. A mini quilt, ends at 10"x20" with free pattern and tutorial. This quilt has a different technique from the others I have made so far. Definitely on my to do list. 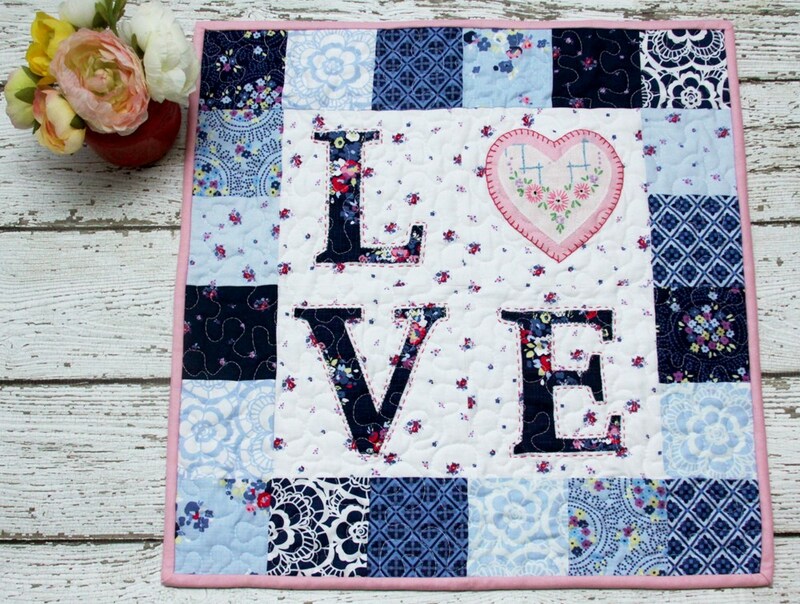 Different from most of the quilt patterns, blue colours are used in this mini quilt, which is quite cool. 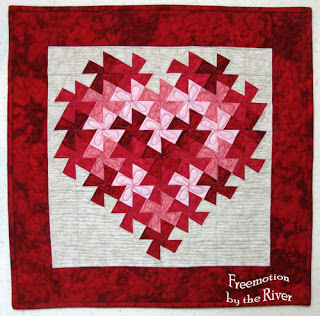 I hope you find the inspiration you need for a valentine quilt project. Any other different ideas? Why don't you share it here with us? Thanks for sharing Information to us. If someone wants to know about Tailoring Applications and Tailoring Guide I think this is the right place for you! I continue playing with fpp blocks, which is great fun to me. The moment I came across these Butterfly Charm Blocks by Lillyella, I thought I must make one. She presents the pattern free. You can download it by clicking on. 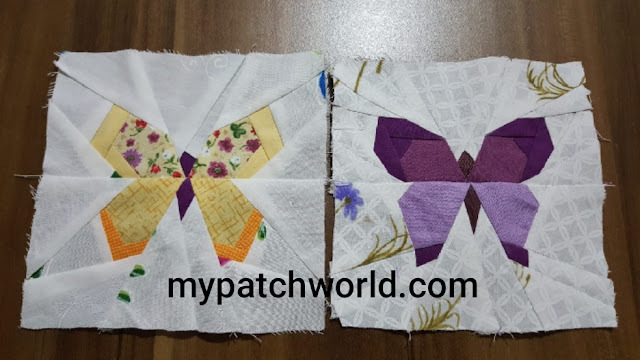 There are three different butterfly blocks, here you see two of them. The blocks measure 5 inches when they are finished. So be ready to deal with small pieces. Colour choices are also important to make a lovely butterfly. It all depends on your tastes. For the first one I chose plain purple and lilac and for second one I preferred yellow, orange and fabric with flowers. I am pretty happy with the result. One of the best part of quilting for me is to decide the choice of colors and fabric because right color and fabric choices make your work better. If you are a beginner and do not know where to start, it is a good idea to start with the simplest forms and techniques so that you do not get lost. That's why I highly recommend you to start with hexagons. 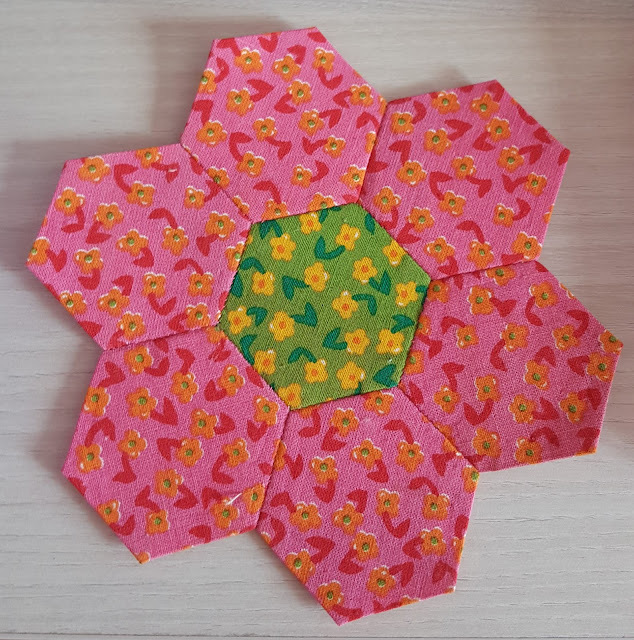 Hexagon flower is a great sewing project, which has only seven pieces. You can make it a pincushion or applique it on a pillow by using hand applique techniques. Here you can find a step by step tutorial for hexagon flower. 1- First of all, decide on what size of hexagon you want to use. There are various hexagon templates in different sizes available on internet. 2- Cut out the template and lay it on the wrong side of the fabric. 3- Pin the template on fabric and cut the fabric. It is supposed to be 1/4 inch larger than the paper template so that you can fold over the paper. 4- Fold one edge over paper template, finger press and baste together. The paper template is to ensure accurate shape and helpful to peace angles together. Quilters use many abbreviations when they use basic quilting terms. These are practical to use; you may not want to use "half-square triangles" again and again while giving quilting instructions. Instead, you may prefer to use HST; since it is easier. When you come across UFO in a quilting instruction or talking, it doesn't necessarily mean that there is an alien in the sewing room! For beginners, it may be confusing seeing all these abbreviations which probably make no sense. So here I'd like to share some popular quilting abbreviations that you may come across in quilting instructions and conversations. When you are learning quilting, it helps you save time to know the terminology.